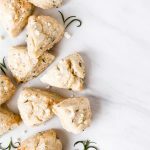 These Rosemary Goat Cheese Scones are the perfect savory breakfast recipe for your next spring brunch or summer party. Something strange has happened to me over the last couple of years. I went from ALWAYS wanting sweet food for breakfast to preferring savory breakfast recipes. This actually works out pretty good when we go out for brunch because Roger will get something sweet, I’ll get something savory, & then we’ll split them! I feel like this is the official sign that I’m getting ready to enter my 30’s. 28 is less than a month away & while I like the idea of being “wiser” (at least in the sense of picking savory scones over cinnamon rolls) I’m not sure if I’m ready to get older. But at least with every year that goes by I learn to love more unique combinations of flavors! 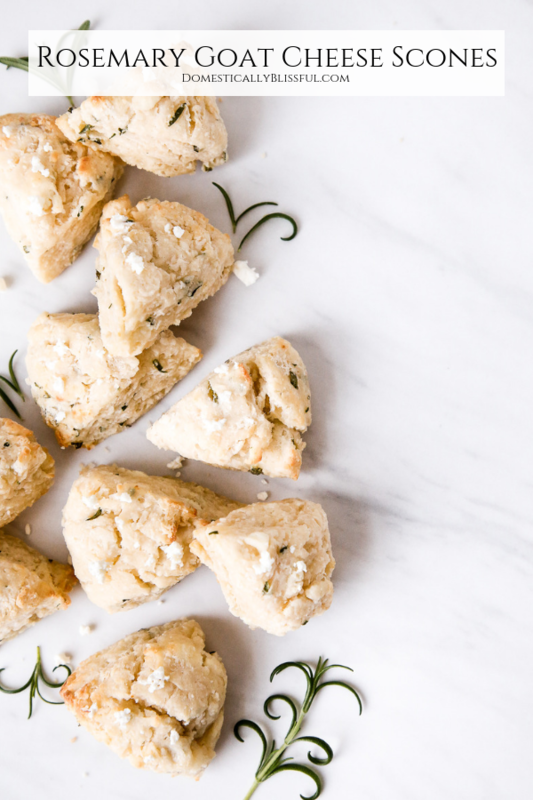 And these savory scones filled with goat cheese & rosemary are absolutely scrumptious. If you need a little bit of sweetness with your breakfast I would highly recommend a drizzle of honey. Because while I do love savory breakfast foods I will never desert my love for honey! And honey & goat cheese are always a winning combination. 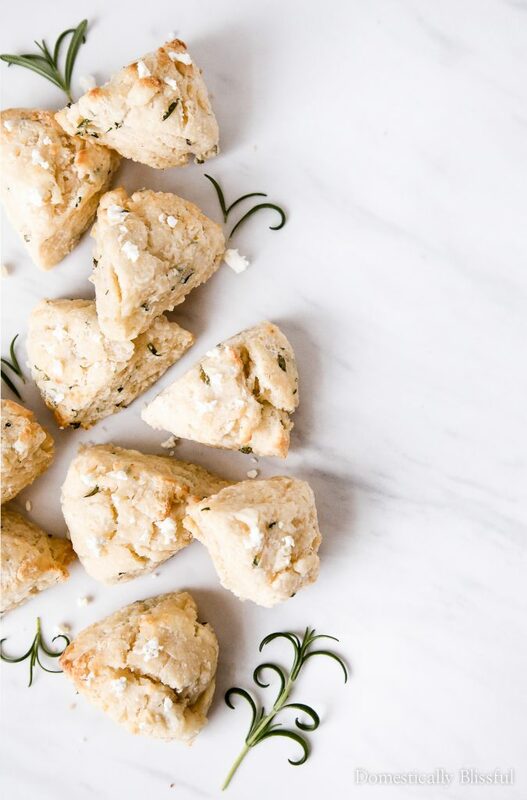 I made 24 mini Rosemary Goat Cheese Scones because I think the mini scones are the cutest, but you can make them into 12 regular scones for a brunch party & they will taste just as delicious! In a medium bowl sift all of the dry ingredients, 2 & 3/4 cups flour, 2 teaspoons baking powder, 1/4 teaspoon of salt, & 2 tablespoons sugar. Use a grater to shred the butter into the flour. Next, stir in 2 tablespoons rosemary & 1/2 cup goat cheese. Split the scone dough in half, place both halves on a floured surface, & using your hands (with a little extra flour) shape the dough into round disks about 2 inches thick. 2 dough disks make 12 scones. 4 dough disks make 24 mini scones. Cut the dough into scones with a pizza cutter. 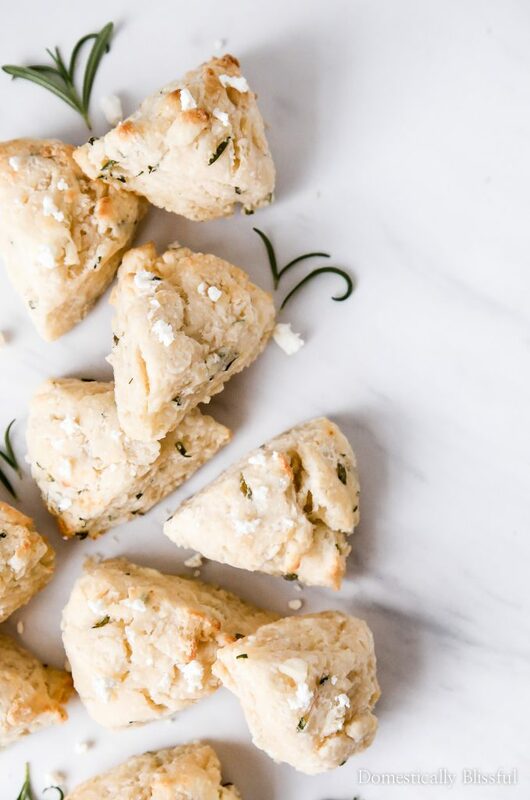 Place the scones on a baking sheet lined with parchment paper & brush the top of each scone with butter. Place the scones in your preheated oven & bake your scones for 15-20 minutes until lightly golden. 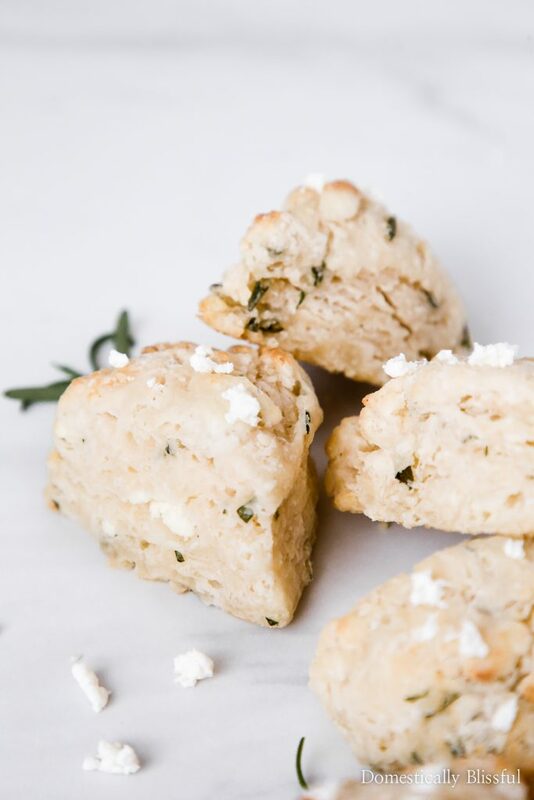 Your Rosemary Goat Cheese Scones are done baking when they are lightly golden on top. If you plan on freezing the dough before baking hold off on preheating your oven. Make sure that you don’t over mix, simply combine to create a dough. You can go ahead & shape/bake your scones if you are in a hurry. I like to place my scone dough in the freezer for 30-45 minutes (covered in plastic wrap) so that the butter gets extra cold so that when the scones bake there will be pockets of butter in the scones! The flavors are enhanced when warm. Be sure to reheat your scones, wrapped in foil, in your oven at 350 degrees Fahrenheit for 5-10 minutes for extra warm flavors. 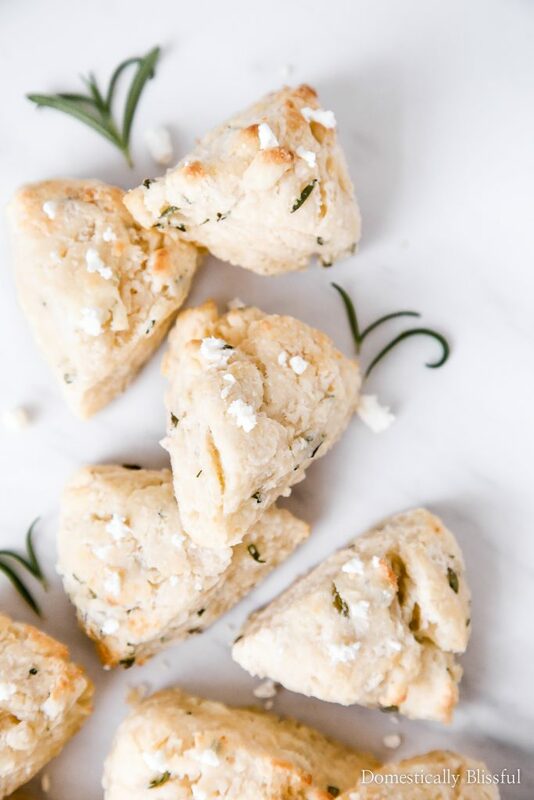 If you make these Rosemary Goat Cheese Scones be sure to share a picture & tag @DomesticallyBlissful on Instagram so that we can all see your yummy brunch! What is your favorite thing about this recipe, the goat cheese or the rosemary?